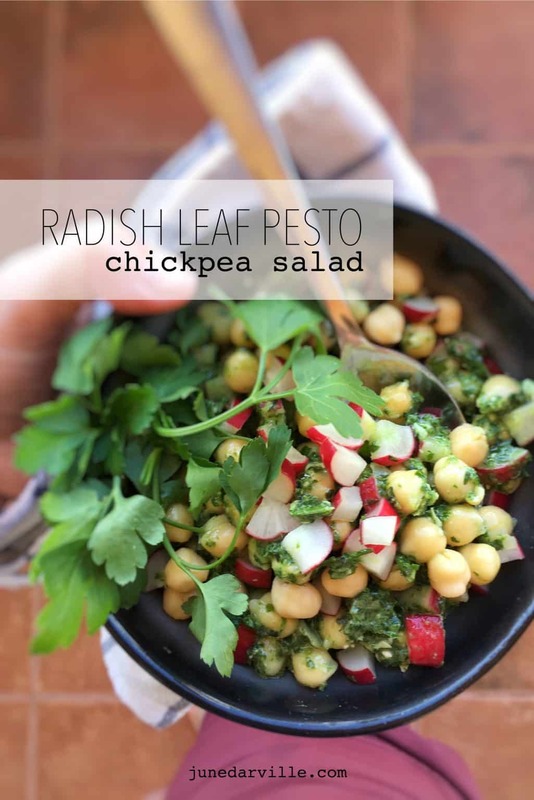 Radish Leaf Pesto & Chickpea Salad | Simple. Tasty. Good. Have you ever bought fresh radishes before? I mean with the green stems and leaves and all still attached? There are plenty of fresh radishes at the farmers market I visit here on Saturdays. Have you ever thought of using the green leaves as well? 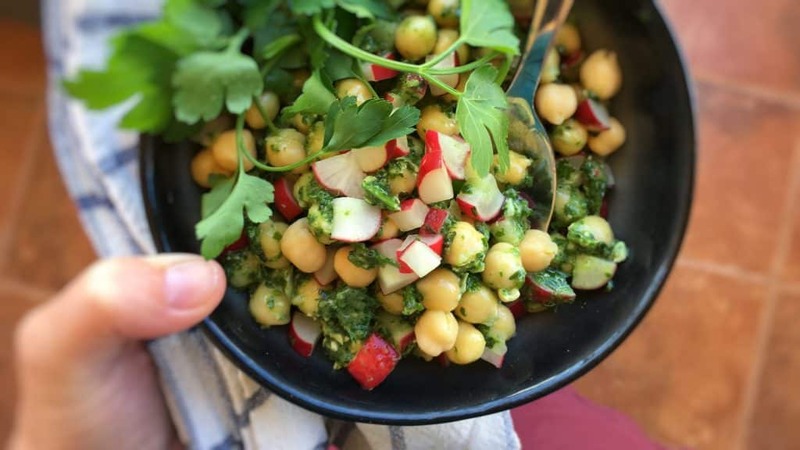 I used to throw them away until the day I found out about… radish leaf pesto! Absolutely! I love radishes. Here at my farmers market they come in several sizes and flavors. You got the small round red ones, these can be almighty spicy. Then you got the very large red radishes that taste much milder. I sometimes buy the long and thin pinkish white radishes too, their flavor is somewhere in between mild and spicy. I love to serve radishes as an appetizer bite: just rinse off any dirt, trim the stems and the little root. Easy. They are a great alternative for the classic appetizer cherry tomatoes! I am sure that you will use the green radish leaves as well from now on. This radish leaf pesto is so cool. And so different from the classic basil pesto. Today I’m making a chickpea salad with it. Plain and simple. Also try out my radish and cheese sandwiches drizzled with the same radish leaf pesto: just scroll down this page to find that recipe ! Lovely lunch idea that one is. 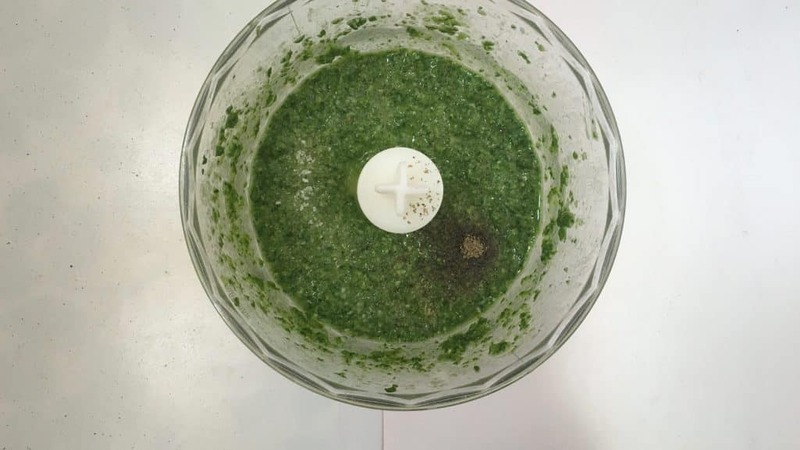 I also prepared this radish leaf pesto in my KitchenAid Cook Processor: scroll down to the second recipe! 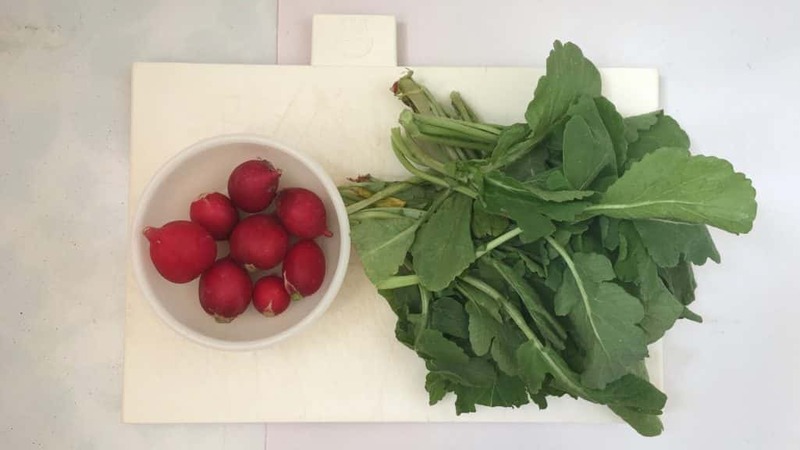 Don't throw away fresh radish leaves! Better make a tasty radish leaf pesto with them! This pesto is great on sandwiches, salads or steak! Clean, trim and rinse the fresh radishes. Separate the green leaves from the radishes. Place the radishes aside until needed later. We are first going to make the radish leaf pesto. 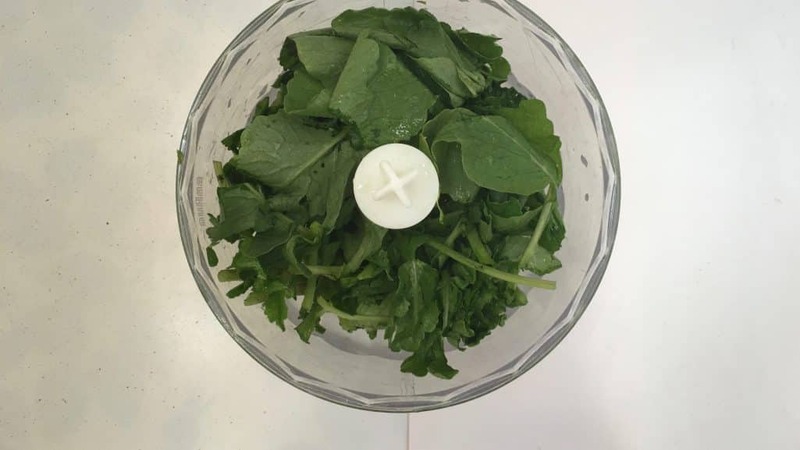 Add the radish leaves to a clean blender. Pulse into a fine crumble. Then add the grated cheese, the pine nuts, the olive oil, the water and a little dash of pepper, garlic powder and salt. 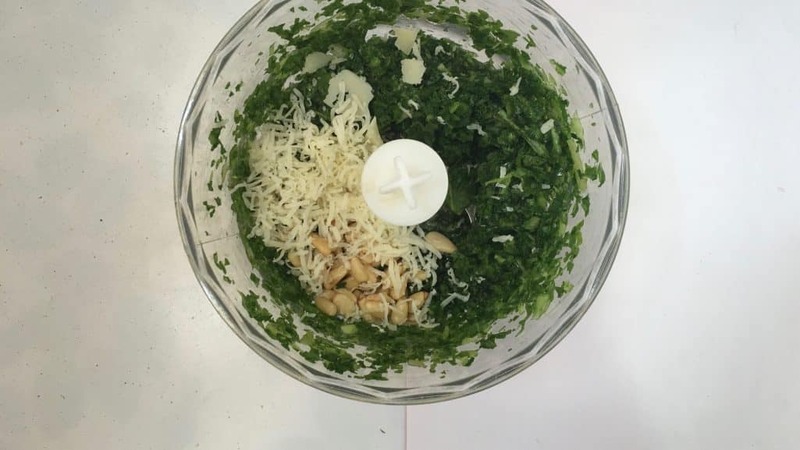 Blend well for 15 seconds until the pesto is well combined. Check the seasoning of the pesto and add extra pepper, garlic powder or salt to taste if necessary. Pour the fresh pesto in a large mixing bowl and add the drained chickpeas. Chop the radishes you kept aside into small bite-size bits and add those to the bowl as well. Stir the chickpea salad well. 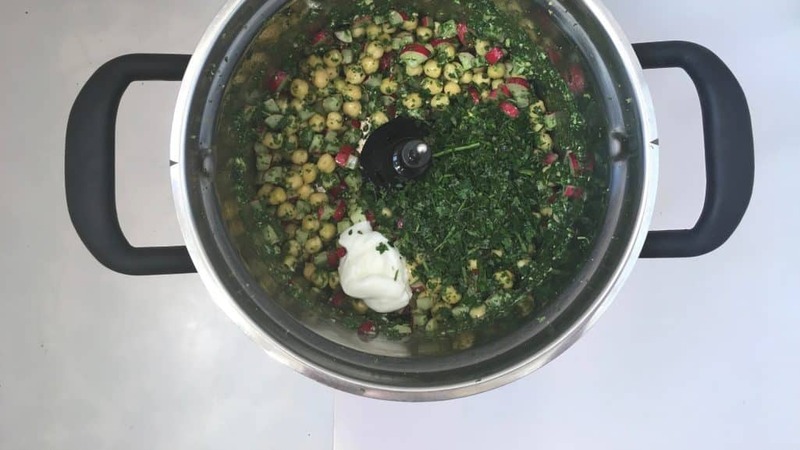 Then add the freshly chopped mint and parsley together with the yogurt. Stir the salad well again. Check the seasoning of the salad and add extra pepper, garlic powder or salt to taste if necessary. Chill the salad in the fridge for another 10 minutes. Serve cold. 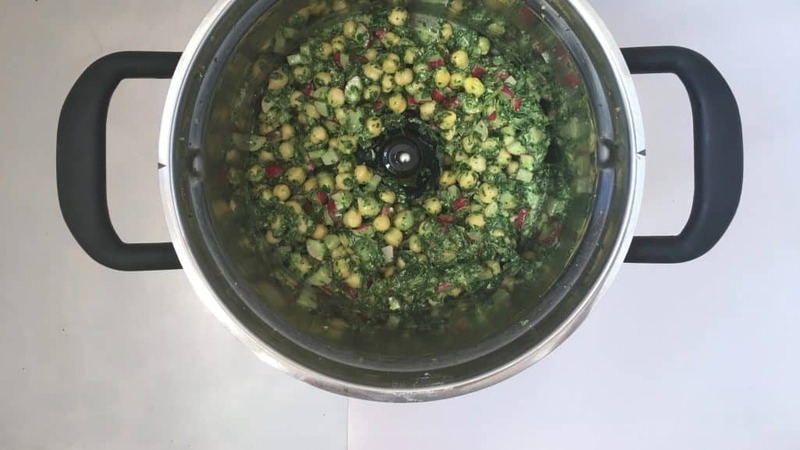 I also prepared this radish leaf pesto in my KitchenAid Cook Processor: a slightly different recipe but the pesto in the end is just the same. Try it out! 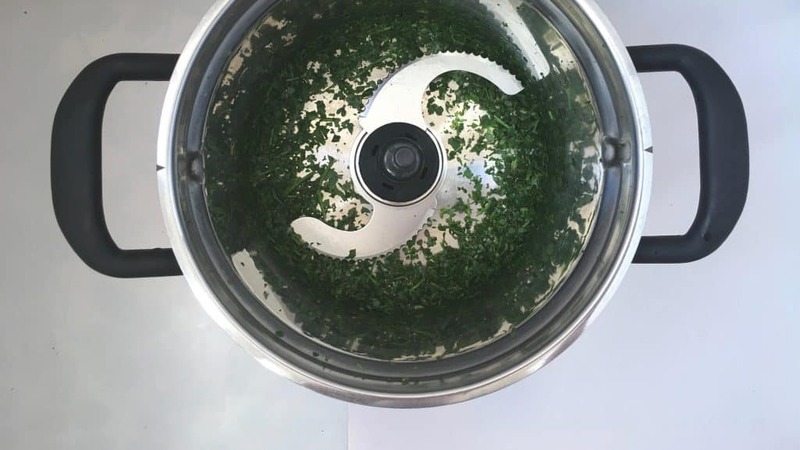 Add the fresh parsley and mint to the bowl of the Cook Processor fitted with the Multiblade and press Pulse for 10 seconds. 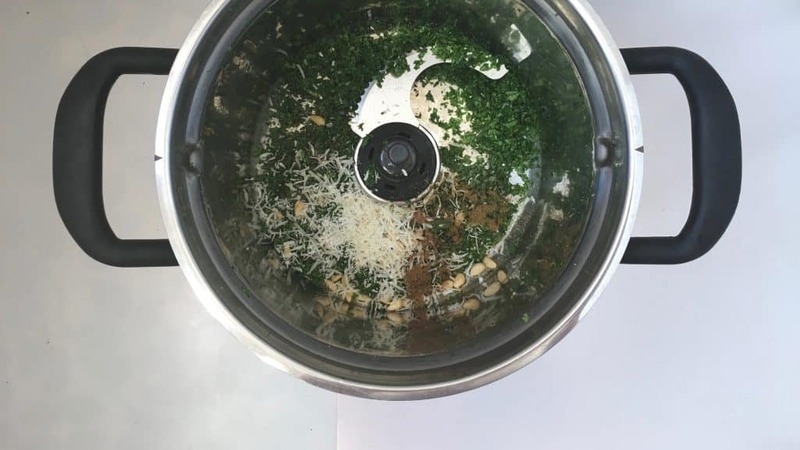 Transfer the chopped herbs to a clean plate. Trim the radishes but keep the green leaves. Add the leaves to the bowl of the Cook Processor fitted with the Multiblade and add a pinch of garlic powder, pepper and salt. Close the bowl and press Pulse for 10 seconds. Then scrape down the sides of the bowl. Add the grated cheese, the pine nuts and the water. Close the lid and press Pulse for 5 seconds. Remove the MultiBlade and replace it by the StirAssist. Close the lid, set the timer at 1 minute and press Start. 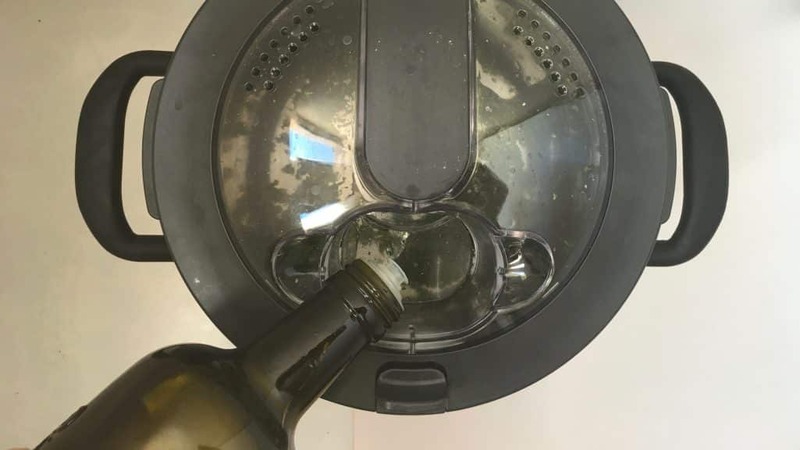 Remove the measuring cup and gradually pour the olive oil through the opening in the lid. Then check the seasoning of the radish pesto and add extra garlic powder, pepper or salt to taste if necessary. 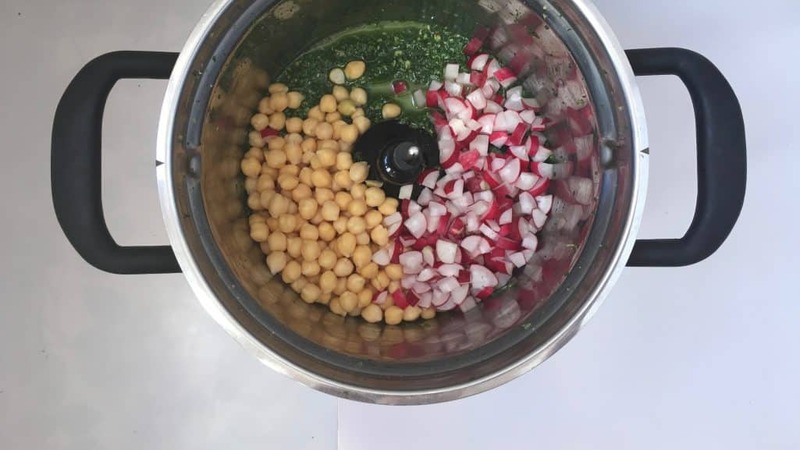 Then add the drained chickpeas. Chop the radishes into small bite-size bits and add them to the bowl as well. Close the bowl and press Quick Stir again for a couple of seconds. Then add the yogurt and the chopped fresh herbs. Close the bowl and press Quick Stir again for a couple of seconds. Check the seasoning and add extra garlic powder, pepper or salt to taste if necessary. Chill the salad in the fridge for 10 minutes. Scoop the salad onto a large serving plate, garnish with extra fresh parsley or mint and serve. Talking of Belgian food: this classic fresh cheese and radish sandwich is one of them! My granny used to prepare it, the hubs’ grandmother too, sure they were not the only ones. I used fresh cheese but quark cheese is also good. This sandwich puts a smile on my face because of its simplicity. A bit of fresh cheese on a piece of crunchy toast, topped with freshly sliced radishes sprinkled with a healthy dash of freshly ground black pepper… Perfect! I admit this appetizer regularly turns out to be my lunch when I happen to be at my local supermarket right before lunch. If you can’t find fresh cheese, cream cheese also works… But it’s a little different in taste. And here again: don’t throw away those beautiful green radish leaves and stems. 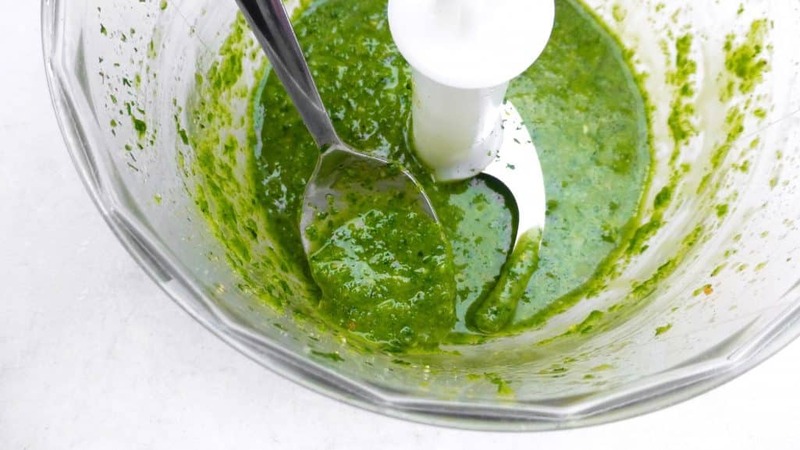 You can make a gorgeous quick and easy green pesto with them! A delicious radish sandwich with fresh cheese and radish leaf pesto, a Belgian classic sandwich! Wash the fresh radishes thoroughly and drain them well. Chop off the green leaves and stems. Don’t throw them away! Clean and trim the radishes and slice or chop or slice them up finely. 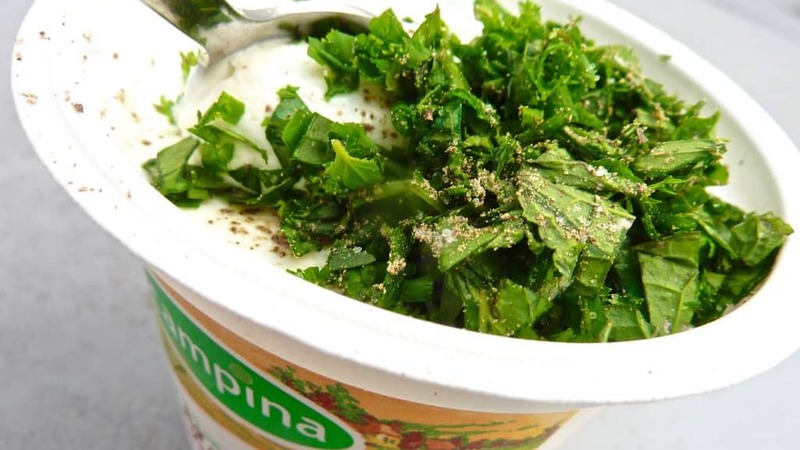 Combine the fresh or quark cheese, white wine vinegar and freshly chopped parsley. Season with a little pepper and salt to taste. Place the cheese in the fridge to chill for 10 minutes. In the meantime make the radish leaf pesto. 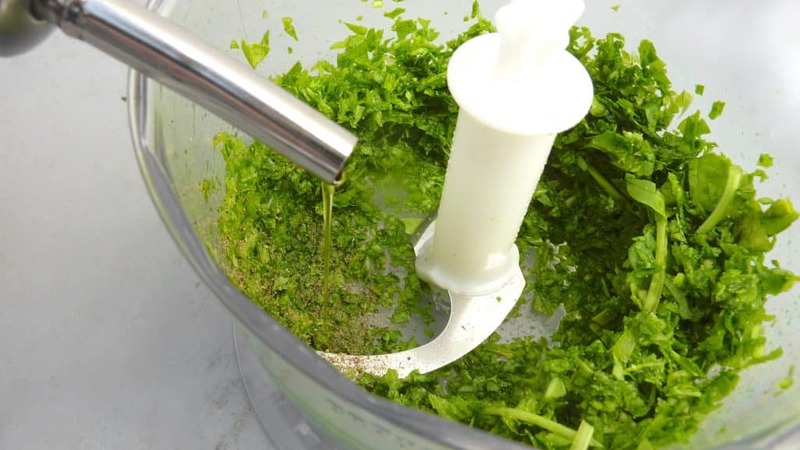 Place the fresh radish leaves in a clean blender. Blend the leaves. Then little by little add the olive oil and pulse alternately. Season with a pinch of pepper and salt. Once you have added all the olive oil, check the seasoning of the pesto and add more pepper or salt to taste if necessary. Toast the bread slices and spread them with the herbed fresh cheese. 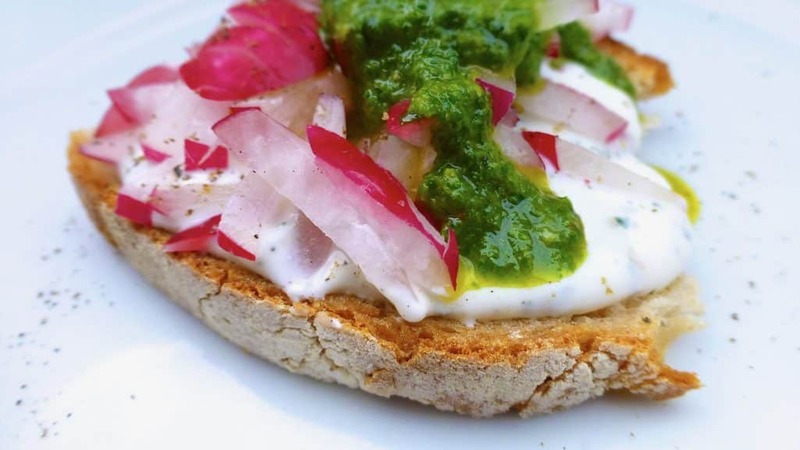 Top the sandwich with a a bit of chopped or sliced radishes and garnish with a good drizzle of the freshly made radish leaf pesto. Finish the sandwich with a little sprinkle of freshly ground black pepper. Serve immediately. Beautiful radishes! They is a great root vegetable to cook with. Like I already mentioned above in my introduction I can find 3 different types of radishes here. But there are far more species out there! Let’s look at the color for instance: you got the bright red radishes and the pinkish white ones that seem to have 2 colors. But did you know that there are also bright white radishes and even purple ones? Apart from the color of their skin, another interesting fact is that the inside of the radishes can also differ in color. Most radishes are bright white on the inside. But some species are pinkish to light red. Needless to say that those radishes look just amazing in a fresh salad! Not only do the several types of radishes look different, they even have special names for each variety. Let’s see what Wikipedia tells me: radishes have great names! For instance: the ‘April Cross’ is a giant white radish. Another great name is ‘Cherry Belle’ is a bright red-skinned round variety with a white interior. Lovely! And I guess that must be the most common one of them all, the radish you can find everywhere. Did you know that radishes are related to daikon? It is also known as winter radish or Oriental radish? This East Asian white radish is used very often in Japanese cuisine. It can be quite spicy is you eat it raw, especially when daikon and radishes are pickled. Daikon can also be steamed or added to soups to soften that strong flavor. A variety that looks and tastes very much like daikon is the black radish. Only difference is that daikon is white and black radish… black of course! So what are the health benefits of radishes? Looking at this vibrant fresh vegetable I’m sure that there must be a bunch of good things about it. 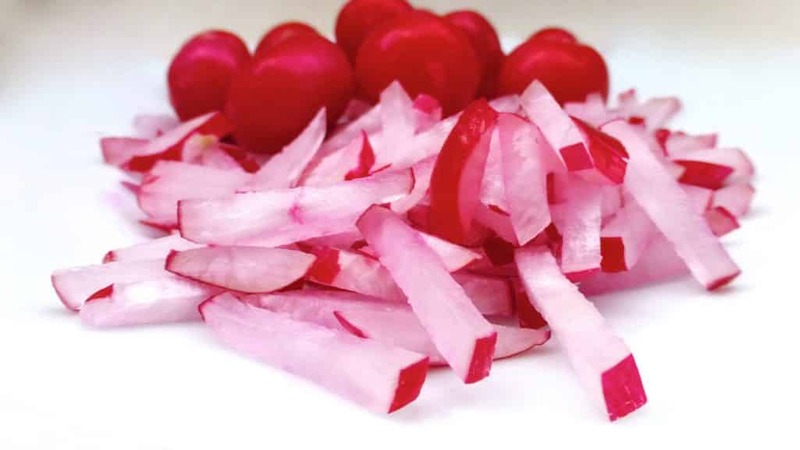 Radishes are a great detox food: radish purifies the blood and eliminates toxins and waste. The consumption of radishes decreases blatter problems and infections: it cleanses the kidneys and blatter. Besides radishes increase the production of urine, which is also great to fight blatter infections. Radishes contain a lot of water and are very low in carbs, which make them perfect food if you want to loose weight. Eating radishes gives your stomach a filling feeling, that’s why you will sometimes see cleaned fresh radishes in supermarkets as a healthy snack option besides carrot sticks or cherry tomatoes. 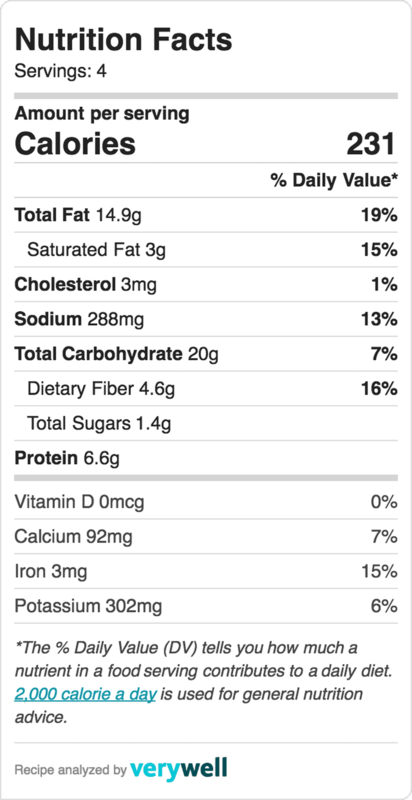 These are just a couple of health benefits of radishes: the list goes on and on though. I could go on for ages about the positive effects radishes have on your health. But I think it is just fair to say that radishes are a great addition to your weekly menu. I love to put them in salads, or on a fresh cheese toast like the recipe above! I should try to pickle them one day, guess pickled radishes would be great in combination with sushi instead of the usual pickled ginger!